Upgraded single story located in Vail Ranch on a quiet cul-de-sac. This spacious home sits on a generous 12,000 sf lot plus, and is surrounded by landscaping including beautiful palm trees. The huge backyard comes with its own two-story observation deck to take in the mountain views or enjoy the peaceful stars at night. 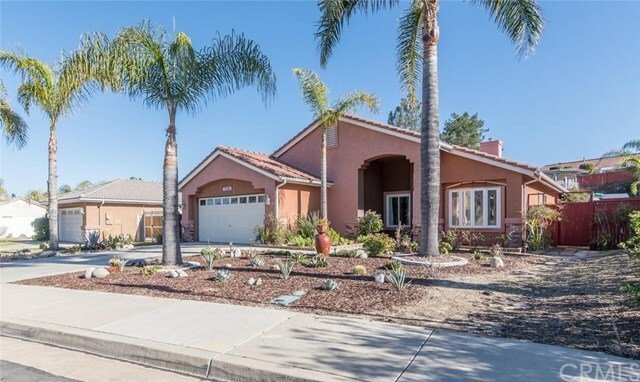 This home is close to all the perks that Temecula has to offer and located in the boundaries of top rated schools such as Great Oak High School. Upon entering the home, you immediately notice the warm toned wood laminate flooring. The vaulted ceiling and windows create a light and bright feel. There is an open floor concept that includes the kitchen and family room, great for entertaining. The kitchen has beautiful granite counters and breakfast bar with tons of cabinet space, pendant lighting, tile flooring, crisp white cabinets and a pulldown faucet. There is a large master retreat that has a walk-in closet and sliding doors that open on to the spacious backyard patio. You will also enjoy dual sinks and granite counters in the master bathroom. There are two additional bedrooms and two bathrooms with an office that could be used as a fourth bedroom! The secondary bathroom has been upgraded in a pleasing neutral toned color palate with travertine tiles and a porcelain pedestal sink and is handicap accessible. There is an attached two car garage and flat driveway. Convenient to fantastic restaurants, shopping, and the Temecula wineries. NO HOA/low taxes.